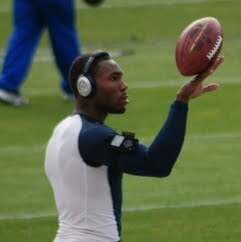 Antonio Cromartie is an American football cornerback for the New York Jets of the National Football League. He played college football for Florida State University and was drafted by the San Diego Chargers 19th overall in the 2006 NFL Draft. Cromartie is credited with the longest play in NFL history, returning a missed Ryan Longwell field goal 109 yards for a touchdown on November 4, 2007. He has also played for the Arizona Cardinals.